Last Friday was my sister Hilary’s birthday. And it just so happened that Jim, Lena, and I were in town because Jim had a conference at the Fort Wayne seminary. I asked Hil if she would like to go out on her birthday and she decided it would be fun to stay in this time and hang out at her house. So then I asked her if she would like me to cook for her. She thought it would be fun if we cooked together. We hadn’t done that in a long time. Not since we made Enchiladas Hermanas, I think. Anyway, it was a great idea and we had a blast cooking together. We ended up doing a tapas style dinner. 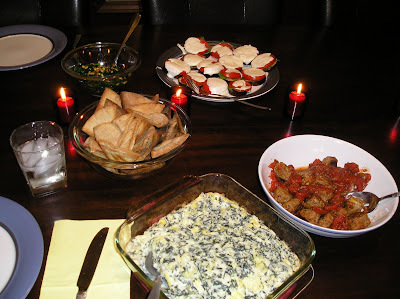 We made four different dishes: Spinach Artichoke Dip, Mini Turkey Meatballs with Tomatoes, Garlic Spinach, and Eggplant Tomato Bake. And we tried a new cocktail, Raspberry Kir. Combine all ingredients and put in a 1 quart casserole dish. Bake 20-25 minutes or until bubbly and brown. Serve with toasted pita or tortilla chips. 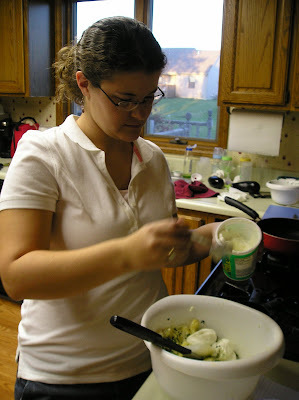 Here's Hilary adding sour cream to the mixture. The original recipe didn't call for it, but we thought it was kind of dry and clumpy. We were glad we did. It turned out beautifully. We toasted pita chips, and they got a little bit too "done" but oh well! It's really good with pita chips but would be fine with tortilla chips too. Combine turkey, onion, garlic, half the oregano, and parmesan in a bowl. Mix thoroughly. Roll into 40 bite sized balls. Heat oil in large skillet. 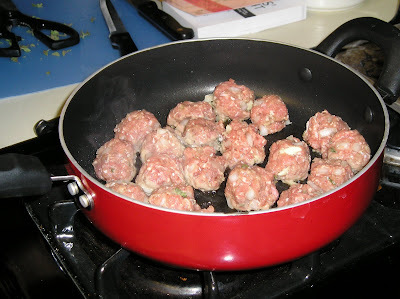 Add meatballs and cook, stirring gently to brown on all sides. When brown, add tomatoes and the rest of the oregano. 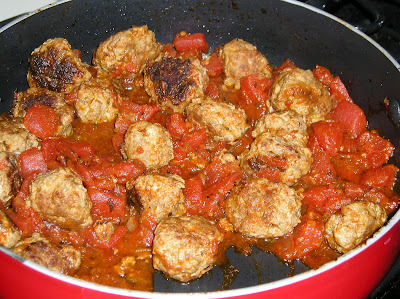 Season with salt and pepper and simmer gently for 20 minutes, or until meatballs are cooked through. Here they are going into the pan. And the finished product. Yummy! 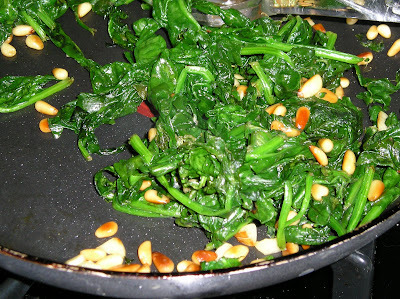 Cook pine nuts in oil for 2 to 3 minutes. Add garlic and cook gently for 30 seconds. Add spinach and cook, tossing and turning for about 3 minutes or until wilted. Season with salt and pepper to taste. So this dish wasn't the greatest. For some reason, the spinach was bitter. We didn't use baby spinach, so we think maybe that was the problem. Also, it didn't have enough garlic. So I am going to try this again using baby spinach and more garlic. Spray a cookie sheet with non-stick spray. 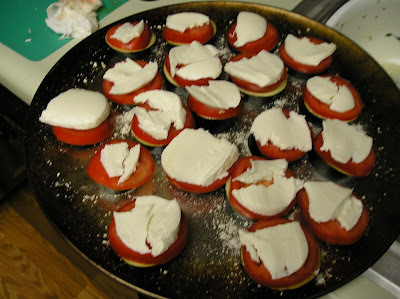 Arrange eggplant rounds on the cookie sheet and sprinkle parmesan over the eggplant. Layer one slice of tomato on top of each eggplant round. Sprinkle with parmesan cheese. We tried an addition to this recipe. We added a leaf of spinach to each one, underneath the tomato. We thought it would wilt down and be yummy. Nope, it didn't wilt down. 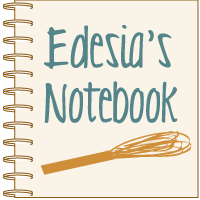 It just got crispy around the edges like dry leaves in the fall. Not good eats! Again, maybe because it wasn't baby spinach? I don't know. Also, we got a ball of mozzarella cheese, sliced it, and put a slice on each piece. That part turned out well. Measure out shots into cocktail glass. Add Crystal Light to taste. We had to change this to be able to drink it. It originally called for 1 oz. of raspberry vodka and a 1/4 oz. of champagne. 1/4 oz? What is that, like half a thimblefull? So we first tried 1 shot of each. But it was still not sweet enough, so that's when we upped the champagne and added Crystal Light. The champagne is nice because it makes it bubbly. And it wasn't pink until we added the Crytal Light, as the raspberry vodka is clear. The finished meal. You can see the Raspberry Kir in the glass before we added Crystal Light to it. We got to eat it at Hilary's new dining room table and chairs. It was so nice! Her dining room is just beautiful. Good job, Hil! We had so much fun cooking together. Can't wait to do it again! I made the meatballs again tonight. I made a double batch for a teacher at work who lost her dad. I made them considerably smaller than we did last time, but I think they are still bigger than "bite-sized". I thought they were much harder to turn (I had at least one turn into a pancake). Two tubes of the pre-packaged Jennio ground turkey made 50 meatballs.